Infiniti has confirmed plans to reveal an electric SUV concept at next month’s North American International Auto Show in Detroit. The concept is said to preview Infiniti’s first fully-electric production vehicle. The SUV concept–name unknown–is also said to preview Infiniti’s design direction for all of its future products. This nugget of information comes as little surprise given Infiniti has already announced that all models in its lineup will begin getting electrified in 2021. Infiniti’s plans specifically call for every model to either be fully-electric or utilize the brand’s e-power hybrid setup. The e-power system uses a small gas engine to charge the battery, similar to the Chevrolet Volt. Infiniti’s EV’s will utilize a new platform the brand is developing specifically for electrified use. This concept won’t be the first time Infiniti has previewed its electrified future. At least year’s Detroit show the brand showed off the Q Inspiration Concept, an electric sedan that also foreshadows Infiniti’s future models. With the Q Inspiration Infiniti executives focused on the concept’s proportions; a larger cabin thanks to the small footprint of an electrified powertrain. 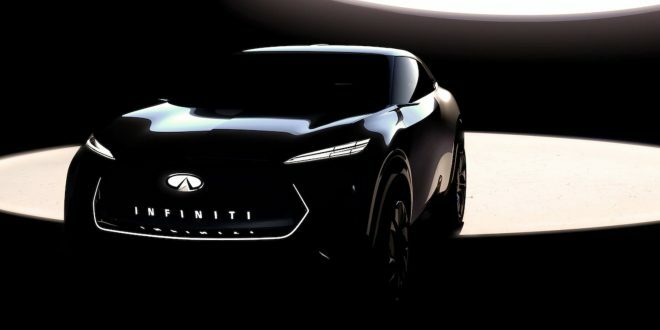 Expect to hear everything about this upcoming Infiniti concept next month during the Detroit Auto Show.